I just love the color purple, especially when it it’s paired with white! This Concord Crush Designer Series Paper was added to Whisper White Card Stock to make a simple, but pretty card for the Challenge over at 365 Cards. They have a different challenge every day, so if you ever get in a funk and are at a loss for ideas, that is the place to go. The flower was punched out using the Blossom Bouquet Triple Layer Punch. This is an awesome punch that will cut out 3 different shapes! I added a Designer Printed Brad and some Hemp Twine to the flower and tied it on the white satin bow. I backed it with a piece of designer paper which had been cut out with the Decorative Label Punch. Easy-Peasy! I’m home from Maine now and I managed to bring back a cold with me, so I haven’t been doing too much. I did manage to make a couple of cards for some challenges. This card was made for the CPS-Card Challenge #241. I used my favorite Designer Series Paper from Stampin’ Up! again-Spice Cake! I used 3 of the designs out of the pack. This time I used Pool Party and Chocolate Chip Card Stock along with it. I stamped one of the images from the Four Frames Stamp Set in Chocolate Chip Ink on the Pool Party CS and punched it out with the Decorative Label Punch. The sentiment on the tag is from the Occasions Alphabet Stamp Set from Stampin’ Up! The set contains 26 stamps, one for each letter of the alphabet and a sentiment to go with it. It’s a very handy set! I have another new card to share. I just can’t help using the new Gently Falling Stamp Set out of the Holiday Mini Catalog, so I hope you don’t get tired of seeing cards with these leaf images! If you haven’t purchased yours yet, you really need to get it. I promise you, you won’t be sorry! You can order everything you need to make this card by clicking on the “Buy Stampin’ Up! Online” Button in the right-hand Column. Candle Wraps Make Great Handmade Christmas Gifts! This is a candle wrap I made for a set of short candle pillars. These are so fast and easy to make and they make great gifts! You can do them for any season or holiday and make them any size you need. Directions: I took a piece of Whisper White Card Stock and cut it so it fit around the candle holder with about 1/2″ extra. I rolled it with the Sparkle and Shine Jumbo Stampin’ Wheel (116542) using Real Red Ink. The Scallop Circles where punched out of Garden Green CS with the2 3/8″ Scallop Circle Punch(118874) and a dot of glitter was added to each scallop. The ornaments were cut out of Designer Paper (not sure from were because I’ve had it a long time) with the Ornament Punch(119847). I put Sticky Strip along the top of the Whisper White CS and added a strip of dotted ribbon the length of the card stock. Then I placed another strip along the side where the card stock overlaps in the back of the candle holder. The scallop circles were adhered to the front of the candle wrap with Multipurpose Liquid Glue and the ornaments were adhered to them with Stampin’ Dimensionals. I put a piece of Hemp Twine through the clasp of a small, clay Gingerbread Man ornament and tied it around the wrap, on top of the ribbon. It only took about 10 minutes and I was finished! I hope you give these candle wraps a try. All the items in bold are Stampin’ Up. Go to my online store to order everything you need to make these candle wraps by clicking on the “Order Stampin’ Up! Online” Button in the right-hand column. I am entering these in The Paper Players Red and Green Challenge #68 this week. Don’t you just love using ribbon on your cards, scrapbooks, and other projects!!! I do … All the new ribbons in the 2011-2012 Idea Book have me going NUTS! I want all of them and I know that some of you love ribbon as much as I do, because I have had requests for more Ribbon Shares…and HERE THEY ARE!!! Maybe some of you have never heard of a ribbon share, so let me explain it in case you want to get in on one of these fabulous deals. I buy all the ribbon and then divide it up into smaller lengths…this allows YOU to purchase one of every color for a lot LESS. 1. 1/2″ Scallop Dots Ribbon – you’ll get 2 yards of 10 colors for $19.00 (+ $2 S&H, if shipped) – if you ordered each roll separately, it would cost you $91.82 with S&H and tax. 2. 1/8″ Taffeta Ribbon – you’ll get 2 yards of 10 colors for $14.00 (+ $2 S&H if shipped) – if you ordered each roll it would cost you $68.72 with S&H and tax. 3. 3/8″ Ruffled Ribbon – you’ll get 2 yards of 5 colors for $12.00 (+ $2 S&H if shipped) – if you ordered each roll it would cost you $57.47 with S&H and tax. 4. ASSORTED – includes 2 yards of each – 3/8″ Artichoke & Blue Denim, 5/8″ Organza, 3/8″ Twill Tape, 1/2″ Chantilly Crochet Trim & 5/8″ Victoria Crochet Trim for $13.50 (+ $2 S&H if shipped) – if you ordered each roll it would cost you $45.85 with S&H and tax. (727) 698-7509. When your share(s) fill, I will send you a Paypal invoice for you to complete the payment process. When all of the payments are received for each group, I will place my order with Stampin’ Up! Please note: backorders and shipping times from Stampin’ Up! to me, are out of my control. As soon as I receive the product, I will cut, sort, and mail them out as efficiently as possible. All ribbon shares are wrapped around chipboard to ensure wrinkle free ribbon. In addition…all shares are protected by cello bag packaging, ensuring safe and dry delivery. I that told you that I love the Holiday Mini Catalog or rather everything that’s in it (or almost everything!). I love the fact that it has a suite for Halloween, Thanksgiving and Christmas. You can see what’s in it by clicking the picture of the mini in the right column. 7. You Are Loved Stamp Set (W 123777) $31.95 (C 123779) $23.95. Love, love this gorgeous girly valentine stamp set. It has markers that you place for easy scoring. 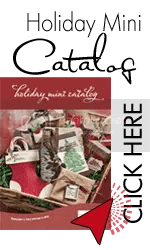 There you have it – didn’t I tell you I loved, loved almost everything in the Holiday Mini catalog? How about you – what are you favorites? 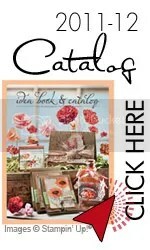 The new Holiday Mini Catalog is now available! Wait until you see it…I want everything! I just love the stocking die, the stamp sets, and the new punches. Do you make cookies? Stampin’ Up! is offering cookie stamps for the Holidays, too! Do you need decorations for the Holidays? Here is a sample of what you can with the new Christmas Lodge Stamp Set and the Frostwood Lodge Designer Series Paper. So many of my customers have told me that they would love to purchase the new ribbon offered in the new catalog by Stampin’ Up! but don’t want to buy a whole roll. So, I have decided to try a ribbon share. This is my first attempt. I love all the new ribbons in the brand new Stampin’Up! catalog but I have chosen only 3 styles and all colors in these 3 styles in this first share. Each participant will receive 34 yards of ribbon. I will do these shares in groups of 5. You will receive 2 yards of each ribbon for a total of 34 yards. This ribbon share is only available to US addresses. Email me at tduncan088@gmail.com with your interest in this share. When I have 5 people I will confirm your ribbon share. The share must be paid for in advance so I will send you a Paypal Invoice. When I receive payment from the 5 participants, then I will place the order, divvy it up, and get your shares to you. Shipping is included in this price. You may order more than one share if you need more than 2 yards. The Stampin’ Up! Summer Mini Catalog sales period will end August 31, 2011 and you will not be able to order most of the items in it after that. There are some wonderful stamp sets in it so if you haven’t purchased the ones you want yet, now is the time to do it! I’m offering a special from now until the end of August…Purchase $50.00 worth of products (before taxes, shipping and handling) from the Summer Mini Catalog through me and receive 15% off your purchase! You must call or email me your order as this is NOT a Stampin’ Up! sale, but my own. 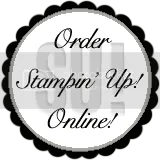 If you order online through my Stampin’ Up! web site, you will be paying full price. You may call me at (727) 698-7509 or email me at tduncan088@gmail.com with your order. I’m posting a few of the cards I’ve made for recent classes using stamp sets and products from the catalog. I hope you like them!